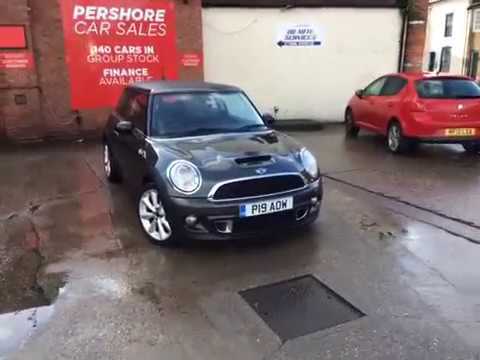 What a brilliant hot hatch here at Pershore Motor Group, this low mileage Mini Cooper S has a full service history with 3 out of 6 services by Mini dealership. Powered by a powerful 1.6 petrol engine with 184 BHP and 0-60 time of 7.2 seconds and is packed with £3,550 of optional extras. This Mini is presented in Eclipse Grey metallic paint with a chrome line exterior, black roof and mirrors, twin exhaust tips, bonnet scoop and 8 spoke 17” conical spoke light alloys wheels. One of the brilliant extras is the CHILI Pack giving you front fog lights, interior light pack, storage compartment pack, automatic air conditioning, Bluetooth, multifunction steering wheel, and Bi-Xenon headlights. Other brilliant features include an automatic 6 speed gearbox with steering wheel paddles, chrome line interior, piano black interior trim, Carbon Black cloth and leather upholstery and cruise control. Before delivery this car will have undergone our extensive pre-delivery inspection covering all mechanical and cosmetic aspects of the car. All our cars come with a complimentary 3 month warranty which is extendable, fresh oil and filter change and a minimum of 6 months MOT and service if required. All our customers benefit from our Pershore Motor Group Reward’s Club which gives you FREE MOTs for life, 6 free wash and vacs by our professional team of valeters per year, £250 off your next car purchase with us at any of our showrooms and a £100 refer a friend bonus scheme.